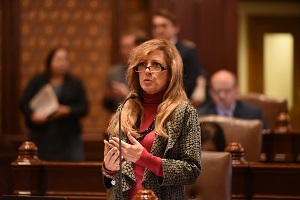 SPRINGFIELD – State Sen. Linda Holmes, D-Aurora, announced today that a joint effort with Illinois Treasurer Michael Frerichs’ office is delivering $30,000 in unclaimed property to two Aurora charities, the Salvation Army and First Christian Church. The two organizations are each claiming 20 percent of a $78,000 estate from an Aurora woman who passed away in 1991. After the original owner passed away, her bank accounts were eventually turned over to the state. Illinois Treasurer Michael Frerichs is currently safeguarding $2.7 billion in recovered cash belonging to millions of Illinois residents. Shortly after taking office in 2015, Frerichs launched an intensive effort to track down the owners of large properties that had languished for years, especially those belonging to nonprofit organizations, employers, and estates. The Treasurer’s office is partnering with Holmes because residents of Aurora and Naperville have more than $18 million and $21 million in unclaimed property respectively, among the highest for any city in the state. Through the I-Cash program, tens of thousands of Illinois residents discover and claim property each year, and the average claim paid is $2,900. A number of much larger properties remain to be claimed in the area, including: $91,000 from a CD account in Aurora, $110,000 from a savings account in Naperville, $104,000 from an investment account in North Aurora, and $100,000 in life insurance benefits in Montgomery. 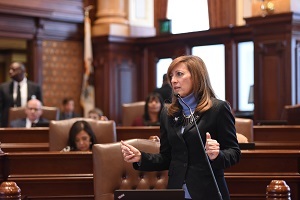 SPRINGFIELD – State Sen. Linda Holmes, D- Aurora, highlighted the consequences of Illinois’ budget impasse in her district. Mutual Ground, a shelter and service provider for victims of domestic violence and sexual assault, signed a contract with the Illinois Department of Human Services for fiscal year 2017. The organization has yet to be paid this year. Michelle Meyer, executive director of Mutual Ground, estimates that the organization is missing over $370,000 in state funding. “Mutual Ground not only provides vital services for victims of crime, but it is an organization that employs 43 people in our community,” Meyer said. “We are consistently being asked to foot the bill for services the State contracts us to provide. Human services are crucial to the overall health of our State and are unfortunately some of the most negatively impacted by our State leaders’ inability to work toward a resolution. This cannot continue"
Mutual Ground offers intervention, prevention, and continuing support services for victims of domestic and sexual violence. The nonprofit was not covered in the stopgap spending plan and leaders have not been told when or if they will receive funding for the current year. The uncertainty has caused the departure of 10 staff members due to attrition and layoffs. As a result, Mutual Ground has been forced to turn away people in need of services. SPRINGFIELD – Illinois Gov. Bruce Rauner, on Tuesday, signed Senate Bill 1488, legislation to extend the River Edge Redevelopment Zone Program. The program allows for an income tax credit to be awarded for the restoration and preservation of a qualified historic structure located in a River Edge Redevelopment Zone. Senate Bill 1488 is effective immediately and extends the River Edge Redevelopment Zone Program for one year, to sunset on January 1, 2018. A River Edge Redevelopment Zone is a specific area designated by the State of Illinois in cooperation with a local government to safely revive and redevelop environmentally-challenged properties that will stimulate economic revitalization and create jobs in Illinois. River Edge Redevelopment Zones are located in Rockford, Aurora, Elgin, Peoria and East St. Louis. The program is administered at the state level by the Illinois Department of Commerce and Economic Opportunity.